Filipino flavors and the Pacific Northwest intersect in Hillman City. One of Archipelago's highlights, miki noodles. At Archipelago the curtain fell. Not symbolically after the bowls of champorado that conclude each dizzyingly good meal, but quite literally, when the panel of green shantung that obscures views of storage and unused dishes crashed to the ground one night, shortly after diners filed in to take our seats. When Verzosa was growing up in Vancouver, Washington, his mom signed him up for tinikling, the traditional Filipino folk dance with bamboo poles. She likely never guessed he’d transfer those performative skills to a restaurant with a mere eight seats. 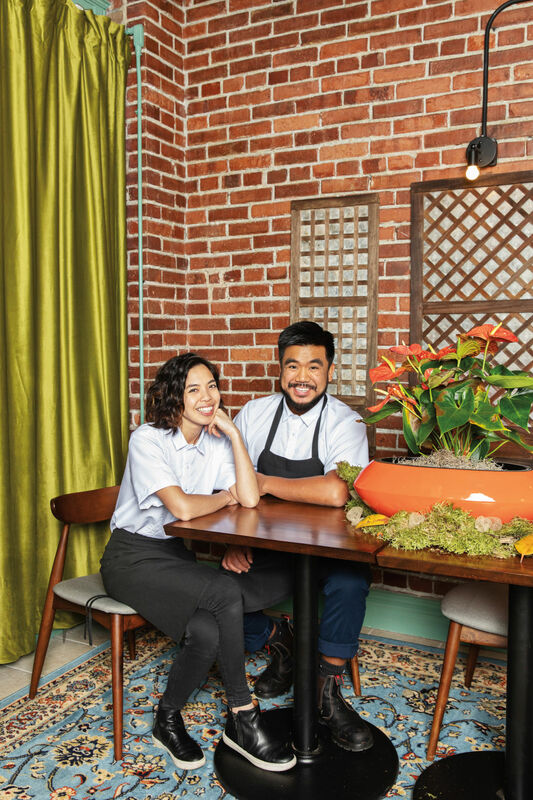 Verzosa uses his kitchen counter as a stage of sorts and his multifaceted heritage—Filipino American, Northwest-rasied—as a catalyst for the most elegant 10-course meal you’ll find in a tiny Rainier storefront, across the street from a tattoo parlor. The curtain might be bootstrapped, and Verzosa looks so boyish that surely he’d get carded procuring his own wine pairings if it weren’t for that neatly trimmed beard. But his aim at Archipelago is visionary: break Filipino flavors down to their essence—in both flavor and cultural context—and build them once again using only ingredients from the Pacific Northwest. Along the way, he touches on our region’s various connections with his family’s homeland. Kinilaw, raw fish marinated in acidic verjus, served on a stone. Though Verzosa sometimes varies the lineup, the next course is often his version of kinilaw, the age-old dish of raw fish, here cubes of lush king salmon that bear the searing trace of his gas torch, marinated in acidic verjus. Manuguid, wearing an embroidered white barong identical to her husband’s but with the benefit of hoop earrings and some fierce eyeliner, plates each portion atop a flat rock, adding slivers of apple beneath our collective gaze. The stones are a souvenir from a camping trip at Ancient Lakes; singed spruce tips from her sister’s yard in the Central District lend smoky aroma and even more locavore bona fides. But the banged-up old sardine tin that props up the rock almost unseen, Verzosa tells us, “is the heart of what we’re doing at Archipelago,” a subtle if foundational tribute to the Filipino Americans who worked in the region’s canneries for the better part of a century. Later he extolls the five Filipino families in Wapato whose produce drives his menu. Consuming a quasi-academic lecture along with dinner might not be everyone’s jam, but at Archipelago it works. The Valencian ultra-ambitions of Tarsan i Jane in Fremont inspire easy comparisons—seats that face the kitchen, technique-packed bites that recast the chef’s heritage with Northwest ingredients—but here in the heart of Hillman City, the model feels less precious. It could be that Verzosa’s also the guy who takes your coat upon arrival and kicks things off with a warning about the tricky hot water tap in the restroom. Or, just maybe, it’s the food—unequivocally marvelous, even if you strip away explication. The couple behind the curtain, Amber Manuguid and Aaron Verzosa. 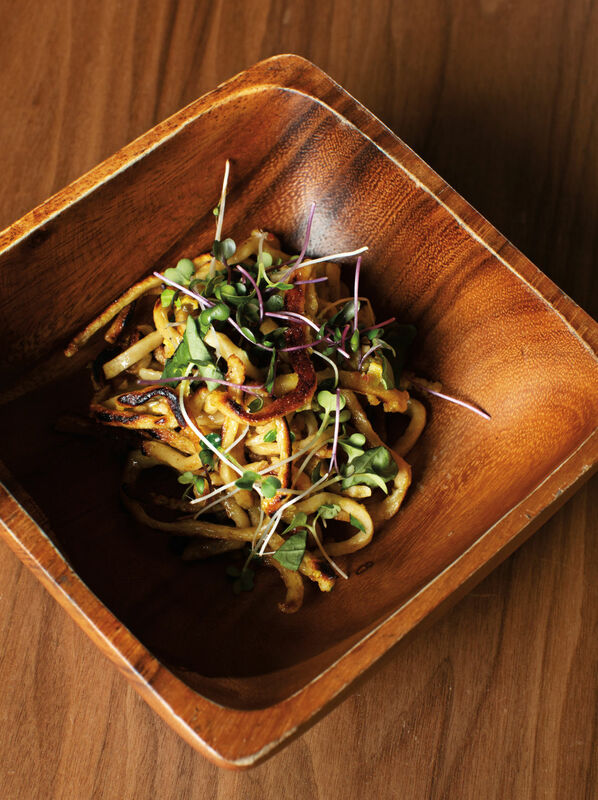 Housemade miki noodles are a consistent dinner highlight, one night a canvas for dungeness crab and savory bacon marmalade, several weeks later a platform for soft scrambled eggs and aligue, or fatty crab roe. Pancit, the rice noodle dish born of the island nation’s history with China, was a nonstarter in our largely paddy-less region. Fortunately Verzosa’s mom, in addition to fostering his tinikling talents, introduced him to these egg- and wheat-based noodles from her native Iloco province. 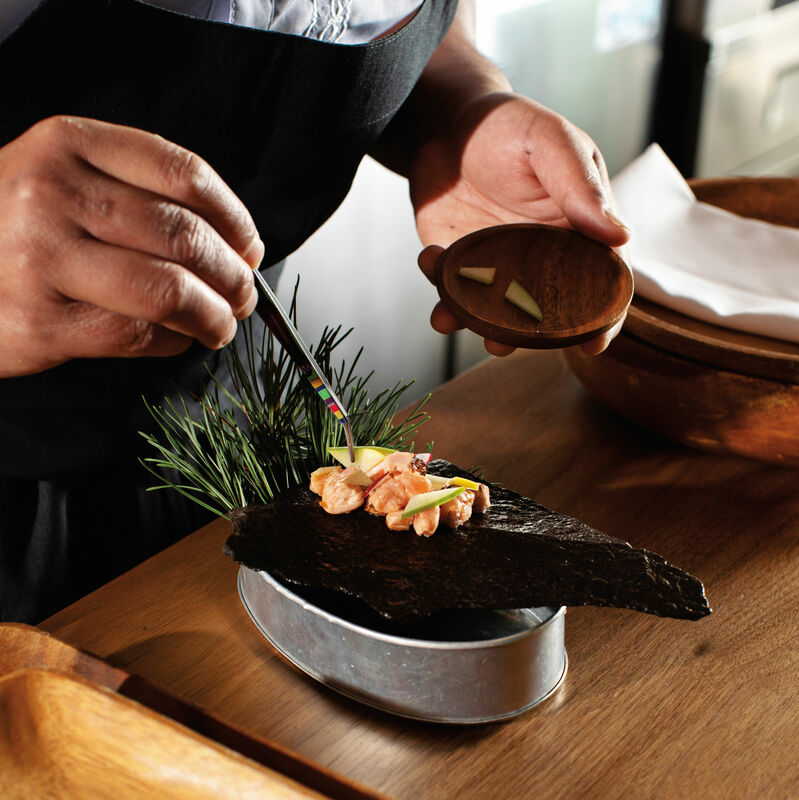 Clearly Verzosa thrives on limitations, though it helps that his cuisine of choice spans untold boundaries. Flavors of the Philippines range from delicate seafood to hearty stews and pack a complex bouquet—salty, sour, savory, sweet. Dishes are bright with vinegar, rich with fermentation, and bear imprints from Spain, China, Malaysia, even the United States. Archipelago's open kitchen, and a Filipino bread roll known as pandesal. 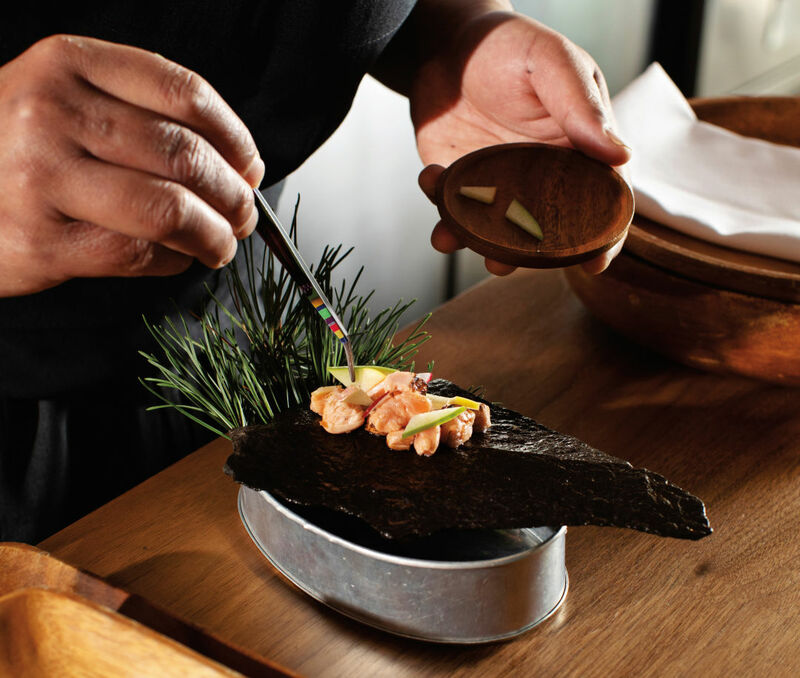 Archipelago opened in December, and each passing month sees fewer dishes whisked away before you can savor the last bite and less frequent missteps like the course where Verzosa and Manuguid came up one bowl short and had to fashion another portion on the fly. Beverage pairings feel like a value at $50, but those are some restrained pours—no worries about tomorrow’s hangover obliterating any newfound insight into Filipino American food. Manuguid remains an experience designer by day, which might explain how the open kitchen remains a paragon of elegance and impeccably styled shelves. I remember. But more than the stories, it’s the food I can’t forget.